ZWARTKOPS, Pretoria BMW Motorrad SA has launched the 2015 S1000RR at Pretoria’s Zwartkops Raceway, some months after its debut at Intermot in late 2014. While retaining all of its predecessors’ sporty character, BMW said it had paid particular attention to designing the bike to be even more rider-friendly. Before allowing the media to test the bikes on the track BMW’s brand ambassador and Super-GP rider Lance Isaacs explained some of the technical aspects of the brand-new design. Included is the fact that the new RR has been given four kW more power (to 146 at 13 000rpm) and a more linear torque curve with a broad plateau from 9500-12 000rpm and a maximum of 113Nm. BMW also paid a lot of attention making the bike lighter, shedding four kg to weigh in at 204kg wet. In the engine department the RR’s cylinder head has been re-engineered with new duct geometry, new intake camshaft, and even lighter intake valves. The intake system now has shorter intake lengths, a larger air box and full ride-by-wire. To keep the power in check, the BMW has several ‘Riding’ modes: Rain, Sport, Race, as well as Riding Mode Pro, which adds Slick and User modes, the latter being configurable to the rider’s preference. The Pro mode also adds launch control and a pits-lane speed limiter. Launch Control, which is only available in Slick mode, works like this: with the bike stationary and the engine idling, you press the start button for more than three seconds (a light on the instrument panel ignites when ready). You then open the throttle all the way, which lets the bike rev to 9000rpm and let go the clutch when you’re ready to go. Once the bike reaches 70km/h the rev limiter is deactivated. The launch control is disengaged as soon as third gear is selected or the banking angle exceeds 30 degrees. In the handling department, there is a lighter frame structure which, Isaacs says, was specifically designed to balance rigidity and flexibility for more traction, greater precision and clear feedback. Chassis geometry has been refined for even better handling and increased traction at the limits of performance. There’s an improved version of the electronic Dynamic Damping Control, familiar from the HP4, to smooth the bumps. The bike features race ABS,a seven-step traction control system, and Gear Shift Assist Pro (BMW-speak for its quick-shifter) as standard equipment. Among all the performance bias, the RR has a rather unusual feature – cruise control, the first (to the best of my knowledge) to be fitted on a superbike. Although no bike is fully idiot-proof, the new S1000RR comes as close to it as I have experienced on a performance bike. Like its predecessors, the new RR is extremely stable and easy to ride. It does what you ask it to do, and is very willing to forgive you if your requests are somewhat imprudent. Traction control is almost seamless – BMW asked us to do the first two laps in Rain Mode before unleashing the bike and the furious flashing of the TC light on the panel was the only way I could tell when the traction control was active. There was none of the sudden loss of power that plagued the earlier generation TC systems, just an almost imperceptible intervention until traction has been re-established. The same applies to the DDC – it is hard to comment on it because you never really feel it working, other than the perception that the track surface is a lot smoother than you remember it. One thing that caught me out initially was the extreme sensitivity of the brakes. After over-braking a few times, I reduced the number of fingers on the brake lever from two to one and started concentrating on braking more smoothly. Once I got the hang of it, I realised how much more confident you feel in knowing that the brakes are really good at scrubbing off excess speed in an emergency. During the media presentation BMW referred to the S1000RR as the safest superbike - and I don’t think their claim is exaggerated. With its combination of almost flawless handling, huge stopping power and competent electronic rider aids, the RR makes an average rider look good and a good rider look brilliant. 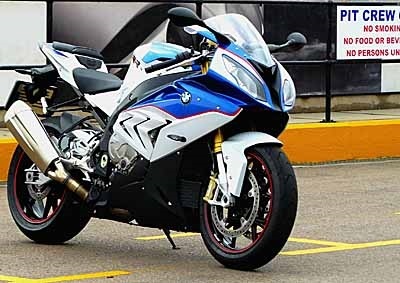 The S1000RR is very fast, a pleasure to ride, and easy to like, and it can be yours for R213 050. *Paragraphs 6 and 10 of the above text have been corrected at the request of the bikemaker.